The cloud has come a long way over the past decade. Cautious business leaders waited for the model to prove itself before jumping on the bandwagon, but by now there is no doubt the cloud provides real benefits. It still represents change, though, and moving operations to the cloud should be approached with eyes wide open. To help you steer clear of the problems that inevitably accompany change, we’ve collected stories based on the real experiences of companies like yours. On each page, you’ll find a cautionary tale founded on the hardearned experience of technology partners who are dedicated to helping businesses realize the promise of the cloud. Each organization is unique, and our goal with this document is to help you recognize warning signs within your own company that could take you down a painful path. Your company may be ready for innovation and new ways of working and jump into the cloud without any issues. Or, like most companies, you may have some internal struggles that make moving to the cloud less straightforward. We’ll help you prepare for potential challenges with best-practice tips that have helped companies like yours. 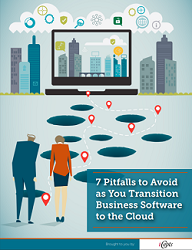 Read on to make sure you avoid the “gotchas” on your journey to the cloud. Get your copy today and download this Free White Paper Below!